Twitter – the 1-Stop Shop? After reading a few months back that Twitter had began promoting businesses within its Tweet deck, I was a little annoyed. But, to be honest, I haven’t found the paid advertisements to be nearly as annoying or intrusive as those that you find on Facebook, both online and on your mobile device. Pinterest is pretty much just one HUGE mobile billboard, which is ok because that’s what its original intentions were and it has worked well. However, Twitter just announced that you can buy and sell items now directly from your Twitter feed using Ribbon. 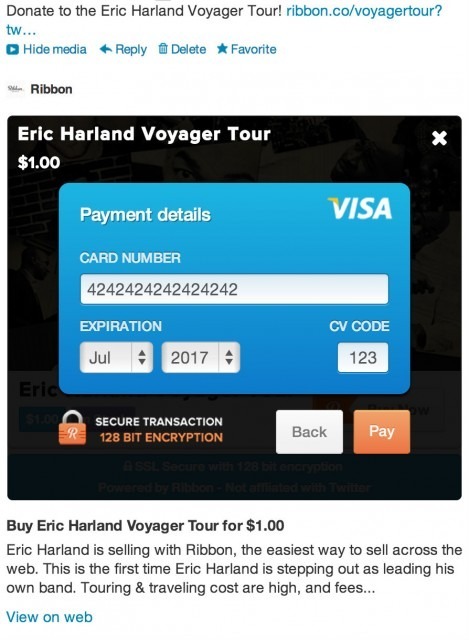 It lets merchants offer an in-stream payment option on Twitter. And for the first time, consumers can find a product or service for sale through Twitter and complete the purchase without ever having to leave the news feed. Thankfully Twitter has limited the number of characters per Tweet to 140, so companies cannot begin to inundate our feeds with lengthy product descriptions/advertisements. Or will they be able to? What’s next with Twitter? Do you think they will change the character limit to allow businesses to put more text into their advertisements? Perhaps if this Ribbon idea takes off and is successful, that could be the case. Yes, I am in a Master’s Degree program working toward my marketing degree, and am all for promoting businesses and products. But, when I am using Facebook and Twitter, I am on there for mostly social and interactive reasons, and to see what’s going on in the world, not to browse for products. My personal thoughts on this type of marketing is that it is for a platform that is intended to promote products. What are your thoughts? This entry was posted in Emerging Media and tagged gadgets, marketing, new, Twitter by Crystal. Bookmark the permalink.